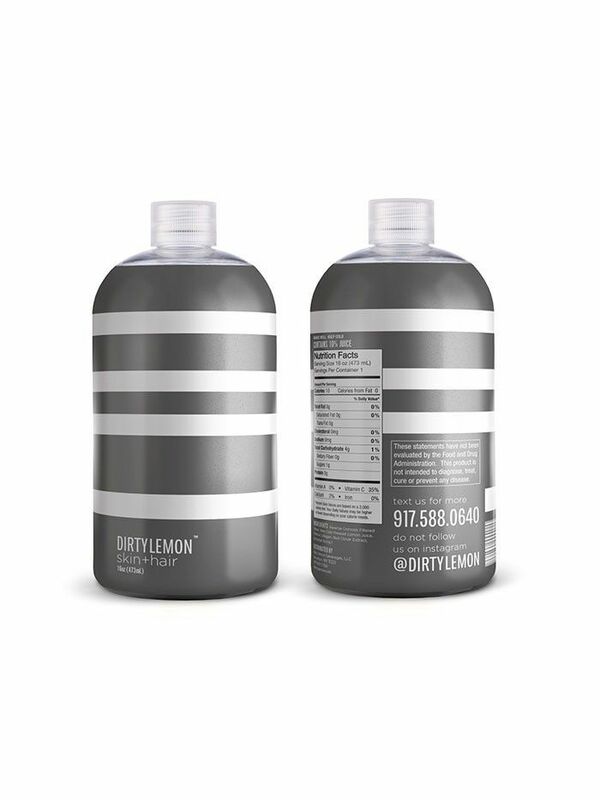 We first were introduced to Brooklyn-based juice company Dirty Lemon when it launched Raw Detox ($65), a product made with cold-pressed lemon juice, dandelion extract, ginger root extract, activated charcoal, and filtered water. It caught my attention courtesy of its easy-to-follow mantra: “To staying real: enjoying your night out, ditching meal plans, cheat days, and 14-day fads. We like things when they're simple. Like a daily detox that suits your life.” The elixir helps to gently reset your body after one too many slices of pizza or glasses of red wine. Oh, and it's delicious, like fresh lemonade and ginger. Now Dirty Lemon is expanding into the ingestible beauty world—but not with your average daily vitamin or supplement. Rather than just using skincare products to stimulate the production of collagen, this drink lets you gulp it right down. A true "beauty from the inside out" endeavor, Dirty Lemon Skin + Hair Tonic ($65) features pure marine collagen (shown to have powerful effects on the appearance of skin, especially as it relates to elasticity and wrinkle reduction), along with a proprietary blend of red clover (a potent phytoestrogen that benefits hair and skin), silica-packed horsetail, and anti-inflammatory cayenne extracts to offer a daily beauty boost targeting hair, skin and nail fortification. And, according to founder Zak Normandin, you'll start to see results in just two weeks. Dirty Lemon works with a team of nutritionists and naturopaths to develop each formula, making sure it’s scientifically sound and gets results. All Dirty Lemon products are made with non-GMO lemons (sourced strictly from a cooperative of local suppliers in the USA and freshly squeezed on-site seconds before bottling) and reverse-osmosis filtered water. So what does that mean in non-science speak? It means it's good for you, the environment, and your conscience. These truly are products that help make the connection between skin care and nutrition—it’s not only about what you’re putting on your skin but also what you’re putting in your body. All you have to do is drink delicious juice and you'll be well on your way to a healthy, wrinkle-free life. Sounds good to me! What's more, over the next few months the company will be rolling out new juices for your every ailment. Can't sleep? You're covered. Upset stomach? No more. In May, look out for a probiotic, designed as a simple daily baseline for optimal microbiome health. One 16-ounce bottle of probiotic contains over one billion active cultures to restore healthy bacteria in the gut and support immune health, digestive health, and protein utilization. Next will be a sleep aid offering in June, which features a proprietary blend of valerian root, hops, and lemon balm extracts, along with magnesium to help promote a restful night’s sleep. And, once you've gotten enough sleep, Dirty Lemon Energy is coming your way. It'll be a lighter take on the typical energy drink, free of sugar and dependent on a proprietary blend of herbal extracts—including ginseng, ashwaganda, and rhodiola—for a natural energizing effect. Which option are you most looking forward to? Let us know in the comments below! Will Eating (And Drinking) Collagen Give You Better Skin? 7 Korean Face Masks That Will Give You "Glass Skin"
Are Dirty Makeup Brushes Ruining Your Skin (and More)?